Freshen your breath and keep your smile bright, without harsh abrasives or irritating chemicals. PowerSmile all natural mouthwash extends the whitening power of PowerSmile toothpaste with Calcium Ascorbate, a form of Vitamin C.Freshens your breath with powerful Peppermint Oil and Menthol while Natural Grapefruit Seed and Perilla Seed Extracts help reduce tartar build-up while Aloe Vera Gel soothes gum irritation. 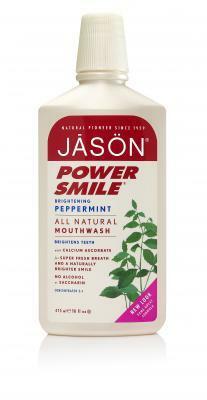 For a brilliantly white smile and fresh breathe, use JASON PowerSmile toothpaste and mouthwash twice a day.